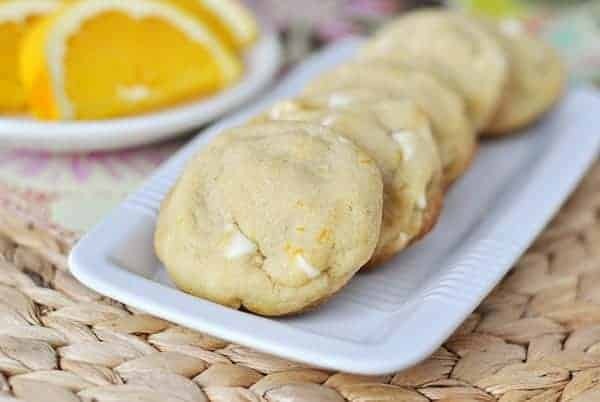 Since the ice cream man doesn’t come around to our neck of the woods and I haven’t bought a box of orange creamsicle pops (or dreamsicle – however you know them) in years, these cookies are the next best thing to filling that desire for an old-fashioned orange cream combination. Vanilla chips (the cream!) and orange zest and extract (the orange!) are folded into an every day, buttery cookie base and the resulting merge of orange and cream is fantastically delicious. Just when I think I can’t possibly come across another cookie variation that will be as wonderful as all the others I love, I find one. And it leaves me wondering, how on earth will I ever get around to trying all the cookie recipes calling to me? One recipe at a time, I suppose. It could be worse. I could be trying recipes for chicken gizzards and liverwurst. I’ll take the cookie challenge any day. Preheat the oven to 375 degrees F. Line two rimmed baking sheets with parchment paper, silpat liners or lightly grease with cooking spray. Set aside. In a small bowl, combine the flour, baking soda, and salt; set aside. In a large bowl, cream together the butter and sugars until light and creamy. Beat in egg, vanilla, orange extract and orange zest until smooth. Gradually add flour mixture and white chocolate chips, mixing until combined. Drop rounded tablespoonfuls onto prepared baking sheets. Bake for 8-10 minutes or until golden brown around the edges, taking care not to overbake. The cookies should be rounded and full, not flattened. Remove the cookies to a wire rack to cool completely. Store in airtight container. These cookies should bake up puffy not flat. If your cookies are flattening, try adding another tablespoon or two of flour to the dough (up to 1/4 cup if needed). Also, the orange extract is optional but really enhances the orange flavor of the cookies. Oh Yay! I’very been thinking about a recipe we used to make when I was a kid and these sound very similar. We only knew them as Mrs. King’s cookies because the recipe came from a neighbor of my grandmother’s in Ohio. As far as I know that recipe was lost long ago. The only difference is that it didn’t take white chocolate chips (not sure those were around back then, I’ll be 50 in August lol) but they had an orange flavored frosting. I will make these for a BBQ and report Back! Thanks for the great recipes Mel. These are a go-to cookie for our family year round. To add some pizzazz to holiday cookie exchanges, I make these, and they’re always a hit. This year, I added 1 cup dried cranberries to the dough. Not only do they add a splash of holiday color, but they taste great, too! Thanks for a great recipe! I didn’t have oranges so I just used orange peel. Do you think the flavor would be enhanced if I used real orange zest? They did still taste good! Yes, I do think the real-deal orange zest adds a ton of orange flavor. Hi Mel! I used this recipe with regular semi-sweet chocolate chips. They were beyond delicious!! My family begs for them! Made these with vegan margarine (dairy free). They were delicious and friends enjoyed. Thanks! Shari – yes, 1/2 cup. Just verifying how much brown sugar to use. Is it 1/2 cup? These are currently in the oven… they smell so yummy! My husband declared these cookies his number one all time favorite. Everyone in my family loved them. thanks! Ahhh! I am so glad to hear you call them ‘dreamsicle’! That’s what I have always called them and everyone else I know calls them ‘creamsicle’! Heidi – I don’t know since I haven’t tried that. Good luck if you try it! Do you think they would turn out using whole wheat pastry flour? I made these yesterday and let me tell ya, they are TO DIE FOR. They may be a top favorite now, on the verge of beating out your awesome chocolate chip cookie recipe. I made these this afternoon and they turned out absolutely delicious! I couldn’t believe how good they smelled when I opened the oven to take out the first batch. I only bought one orange, though, which I don’t think yielded quite enough zest. Next time I’ll be sure to get two just in case. Thanks for another great recipe! I just made these- they’re amazing! Light, fluffy, and delicious! I didn’t have any orange extract, so I just added a squeeze of fresh OJ. this takes me back, mel–creamsicles were always my favorite! I heart creamsicles, I’ll definitely be trying these ASAP! I just made these for the first time a few weeks ago and loved them! Definately a keeper. Used to love a creamsicle as a kid. And, I’m with you on all those untried delicious cookie recipes still out there! Will be making these next week for dinner with the girls – perfect ending to a summer suppper, thanks! I’ve never commented on your site before, just I just had to tell you that I love it! It is my favorite and go-t0 recipe site. Everything I have made of yours I love! Thank you! Thank you! and my family of 6 thanks you too! I make something of yours every week! Yum! God bless! This cookie hits some of my very favorite flavor notes. White chocolate? Yes! Citrus? Indeed! These look nice and fat like how cookies should be! I bet they have a really nice texture, too. I can’t believe I’ve never sent you this recipe. I have been making these cookies for at least ten years. I can honestly say they are my favorite. 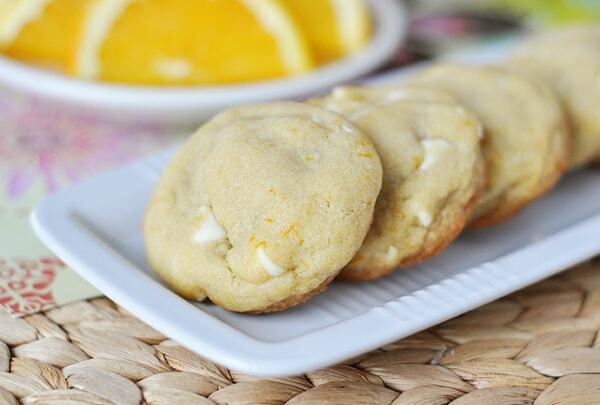 Try them with tangerine zest. You just might die. I need to make these cookies!! I’ve been going through a huge creamsicle phase lately! I just posted about these cookies a few weeks ago. They are sooooo good! I substitute lemon zest for the orange zest sometimes too, which is also amazing. great Idea. I am always looking for different cookies to make with my little kids. the hubs favorite dessert is cookies and milk, but sometimes you just get tired of chocolate chip. (well I do…im not sure he does….) these will be fantastic for summer. These are great! My husband loves the orange creamsicle flavor! I just made these last week and they are Amazing !!! Yum! I should make these for my coworkers. They would love ’em! I’ve been making these for a few years and now they’re my famous cookies that all my family requests. Definitely make them! So funny, my husband was talking about how much he loves creamsicles, just last night! I was surprised, after being married for 12 for years, I was unaware of this! Thanks for the recipe!! You rick girl!! I make something very similiar and I LOVE them! I haven’t had an Orange Creamsicle in years! 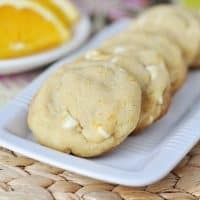 I can remember the creamy vanilla and orange combination was so delicious, and these cookies sound like they will be amazing! The perfect summer cookie- yum!